holiday together. John and I were both able to get a nice chunk of time off. I had a little over 2 weeks and John a little less than that. It made it very hard to get back in the swing of things today! We had a traditional Goodwin Christmas again this year. Grandma’s on Christmas Eve, our house Christmas morning, Grandpaman’s on Christmas afternoon and evening. We had lots of snow as well. 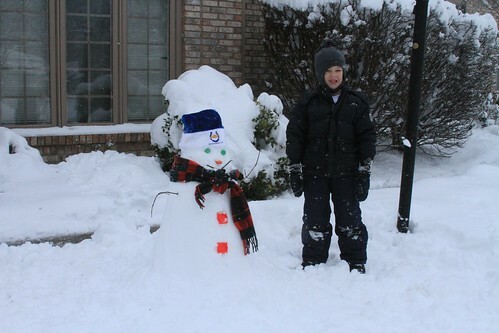 John and Hayden (mostly John) made a snowman, and John did lots of shoveling. There was plenty of time for Legos and doll babies and puzzles and books and Wii video games, and Mommy and Daddy had time for running and rowing, reading, sewing, and watching movies. And eating, oh the eating. We rang in the new year with newly wedded Mike and Mandy (Mandy is my cousin). They came down from Chicago with their dog Hadley, who actually made our dog Lucy tired (Hadley is 2 and Lucy is 6, but we never thought anything could slow Lucy down!). We went bowling with them – the kids first time, and Hayden loved it – went out for dinner (note to self, reservations are a must on NYE, no matter that we didn’t need them last year), and played Just Dance 4. Great time! What a wonderful Christmas! Hayden was at the best age for the holiday. He was so excited all month long about everything to do with Christmas – the lights, Santa, presents, Christmas songs, “candy train” (our advent calendar), Christmas cartoons… It was really a blast to go through the Christmas season with a 4 year old – it made it feel magical, the way it did when I was little. Hayden would have a lot of fun listening to Christmas songs in the car. He would always ask for Christmas music if it wasn’t already on. He liked to sing jingle bells or Rudolph – my mom was babysitting for us and I got a text that she was enjoying listening to his sweet voice singing Rudolph and jingle bells over the monitor while he was supposed to be sleeping. Even Layla started doing her own singing along to jingle bells after a while (her version of singing is mostly singing “eh eh eh” to the tune, and every once in a while throwing in a word that sounds about right). 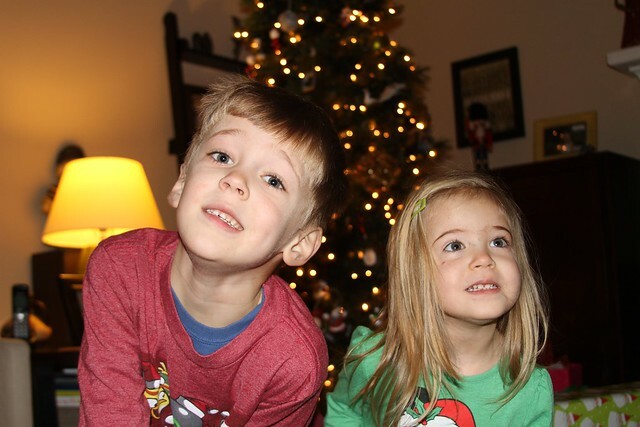 We spent Christmas Eve with Grandma and Grandpa and Dusty and Andy and their respective families. Christmas morning we spent at our house unwrapping presents and eating cinnamon rolls. Hayden was really quite good with it all considering the amount of waiting for other people to open and not really being able to play with everything right away. I remember last year it really became too much for him after a while. Then in the afternoon after Layla’s nap we went to Grandpaman’s and did some visiting with Grandma G’s family. The whole Christmas thing was really great. John and I also had nearly 2 weeks off work, and it was such a joy to just spend tons of time together as a family. It was really hard to go back to the routine this week. But, I guess if we could do that all the time it wouldn’t feel as special. Layla’s first Christmas went by very well. She was a little superstar for the whole time. (she is of course a superstar all the time!). She was a little more interested in opening the presents than I thought she would be (saying that she didn’t have to do much, Hayden took care of the majority of the opening), but predictably liked eating the paper more than the presents. She also seems really interested in Hayden’s presents. She was discarding her presents and wiggling around to get her hands on some of his toy cars or anything else she can. Layla of course got some very cool presents of her own too. She got some beautiful clothes (being the first Grand daughter I think everyone loves buying her clothes as there are so many pretty little girl outfits. ), lots of rattle and chew toys (sounds like what Lucy and Mimi got too!) and this very cool dragon ball pit toy. It is a dragon that is filled up with with little balls you find in those big toy pits. She loves hanging out in there! Does this even count as a blog post? Let me start another one and see if I can stay on topic. The kids, right! The kids. Little late for the Christmas blog I know but better late than never – right? I’ll keep it short. Hayden definitely started to get the hang of Christmas this year and thoroughly enjoyed the idea of presents, even if wanted to open everybody elses! As soon as he saw a present as far as he was concerns it was fair game to whoever could rip the paper off first. I don’t think Kara or I got to open a single present as Hayden took care of that for us! “Open presents?” was a very popular phrase that week!! One of the magic moments was when he was opening his presents. He was working through his toys and getting excited, and he came across some clothes, he just threw down the box/clothes and grabbed the next present! Just like his daddy!!! This year was very different. We had “Cookies With Santa” within our neighbourhood at the local primary school. When Santa turned up Hayden was really excited and rounnign around in circles. Then like a really good boy he lined up behind the other kids and waited his turn to sit on Santa. 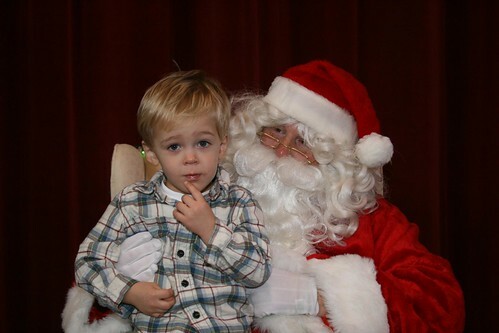 Once up there he sat up on Santa’s knee and even told him what he wanted! (an Orange race car apparently!!) I was really impressed because often he just goes quite in situations like this. He even managed a Dr Evil impression for the picture!! 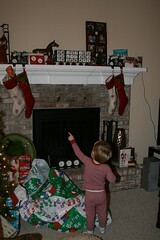 When Santa was leaving Hayden was in the perfect place in the room and got an extra high five from Santa. He face lit up like a proverbial Christmas tree! It was very sweet!